The ProWash Cycle Dishwasher offers intuitive, 1-touch control that makes real-time adjustments to cycle time and water usage to help deliver exceptional results. Both the inner tub and lower wash arms are made of stainless steel to help withstand the test of time by resisting streaks, stains and odors. As an added benefit, the stainless steel interior retains heat to help improve drying performance. The SatinGlide Max upper rack creates a smooth, premium feeling when pulling out the upper rack, particularly with heavy loads. And with KitchenAid, you get superior performance that includes a Heat Dry option to ensure dishes are dry when the cycle ends. Dishwasher Size 24 In. 24 In. 24 In. 24 In. Can the top rack be taken out to accommodate larger items on the bottom? How do I adjust the height of the upper basket? Is the black finish glossy or matte? Can the silverware basket sit on the other side (left side) of lower rack! The answers above are all &quot;No, because the tines on the left would prevent that.&quot; Since the lower rack is removable, can the whole lower rack not just be turned around so that the utensil basket is on the left? Where does the steam vent out at? So many new dishwashers vent out on top underneath counters or into the cabinets on side causing damage and mold/odor issues. I was originally misinformed by Kitchen Aid, they told me the steam vented out the bottom, below the door. After getting it unboxed, I saw it vents out of the top-level side edge of the door, which is under the top edge of the counter top, and not where the vapor barrier is placed. Kitchen Aid should get their money back from the so called engineers that designed this, and fire them. Venting out the front is better. These are not the Kitchen Aid when made by Hobart, today it's just a name, but keep in mind that all dishwashers today are following the failed European energy efficiency style. 24 in. 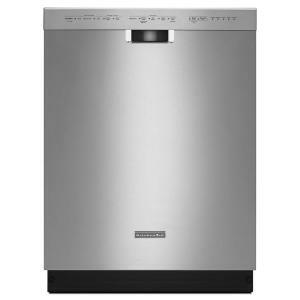 Front Control Built-in Tall Tub Dishwasher in Stainless Steel with Stainless Steel Tub and ProWash Cycle is rated 4.5 out of 5 by 6435. Rated 5 out of 5 by Steve from Still early on, of course, but so far, so good. The dishwasher has all the features I need and is... Still early on, of course, but so far, so good. The dishwasher has all the features I need and is nice and quiet. The rack setup is good. I can fill the dishwasher pretty efficiently although I'm still working out the bet layout. The silverware tray is nice, the slots for individual pieces actually works quite well. The Pro-Wash cycle (auto soil sense) seems to work qukite well. Kudos to both Home Depot and Kitchenaid (Maytag) for standing behind their product. Somehow, the door of the dishwasher was damaged in transit and I didn't see it until after the dishwasher was installed (self-installed). There's a protective plastic bag over the door that I didn't remove until the last stage of installation so didn't see the dent until then. Kitchenaid agreed to order the new front panel and have it installed, no problem. While happy with Home Depot's response as well, in the end, it would have been quicker to have contacted Kitchenaid directly and not involve HD at all. Rated 1 out of 5 by Woodie13 from Please Do not buy any KitchenAid Dishwasher, I purchased Model KDFE104DSS3 in June 2016, it is sh... Please Do not buy any KitchenAid Dishwasher, I purchased Model KDFE104DSS3 in June 2016, it is showing rust on front and inside. Called KitchenAid since it is in Warranty period, the Technician came and informed me he can't do anything, I need to call Whirlpool and gave me the phone number to call. There are around 10 spots on Stainless Steel Dishwasher that are showing Rust. Under no circumstance Stainless Steel is supposed to catch / show Rust. I am in process of contacting Whirlpool, will update my review. Pictures are uploaded. These pictures are taken after the Technician tried his best to remove rust with his chemicals / WD40 etc. I have taken bunch of pictures of all, not sure how many I will be able to upload. Also it is true that the front facing buttons are extra sensitive, we stand close and if any button gets touched very slightly the Dishwasher comes in action. Hope this Review will help someone take right decision before they purchase a Dishwasher. Rated 1 out of 5 by Boucanes from Disappointed with Dirty Dishes We have had this dishwasher for just over 2 months. We noticed a problem right away, dishes came out dirty, wet, and the Cascade pod was almost intact at the bottom of the dishwasher. The technicians first replaced a faulty pump. The next load or two had the same results as before. We also noticed although we tried the Heat Dry setting, there was no heat. Technicians came and told us the problem was our water wasn’t hot enough and suggested we run the hot water before starting the dishwasher. We also ensure we had the recommended rinse agent and detergent. We still had dirty, wet dishes and soap deposits. The technicians came again, ran diagnostics and all came back ok. They then replaced the control panel. Although most of the dishes are dry, Even on the tough setting, with Sani rinse option and high temp options selected, I am disappointed to find dirty dishes over and over again. I’m attaching some photos of examples, including this evening. I regret ever buying this machine. Rated 5 out of 5 by MDS62 from 100% Happy! Thanks LG! Originally bought a GE dw to match our other appliances (reviewed) and was very disappointed. Returned it for an LG, After LG cancelled their delivery twice, bought the KitchenAid and couldn't be happier. After 10 days, every load has come out clean and dry. It's quiet, but not as quiet as the GE, which is okay with me because I always suspected that the GE wasn't doing a good job because I couldn't hear it working. The upper rack is on a high quality track that is very smooth. The utensil basket is in the lower rack rather than on the door. The GE had it attached to the front of the top and lower racks and utensils never came out clean. I actually took the lower basket off and put it in the lower rack and the utensils came out clean, so I'm convinced that it's a bad design to have it on the front of each rack. The lower spray arm has 4 arms, the GE has 2. Not much really to say other than I'm 100% happy with this dishwasher. Rated 3 out of 5 by Ohiogirl from It's OK but not as good as old washer Chose this one because it uses more water on express and light than all the others so it does wash the dishes well but does not dry completely them unless you are there to open the door for a bit before you put dishes away. There is no way it will hold 14 place settings. We ran our old washer once every 3 days, have to run this one every 2 days. No way to sit cups so they don't collect water in the bottoms. Well there is but then you give up space for 6 glasses. Much prefer washer that loads plates from front to back rather than sideways. The silverware basket is a disaster. Who has time to put each piece in a slot? Then when washed you must handle the eating portion of each piece to remove and put away. Took off the dividers but have same problem because the rack is too tall. Solution: I am using the basket from my old washer! The most positive thing I can say about it is that it is QUIET. You barely hear it run. Rated 5 out of 5 by john from Install was simple as replacement unit. Unit has wheels for back legs and adjustable front legs.... Install was simple as replacement unit. Unit has wheels for back legs and adjustable front legs. Unit is exceptionally quiet. Normal wash cycle is quite long but Express wash seems to do the same cleaning but quicker. Have only owned for a week but after several washes, all came out clean, dry, and no residual stains. I love the adjustable top rack - can now fit long stemmed glasses on top when necessary or big items such as cookie sheets on bottom when necessary. Overall quite satisfied. Only complaint: The LED lights used to identify the cycle are quite bright and make reading the writing on the door difficult - with time, I'll know what they are by memory but now I have to put my finger on the light itself in order to read what is written behind it!